This Rated users dialog is accessed from the Play->View rated users... menu item. 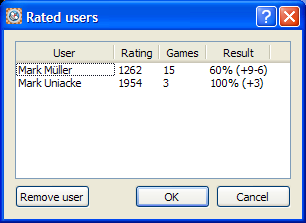 It shows the current users who have ratings, the number of games played and the results so far achieved. Please see our Elo Ratings section for an explanation of ratings.